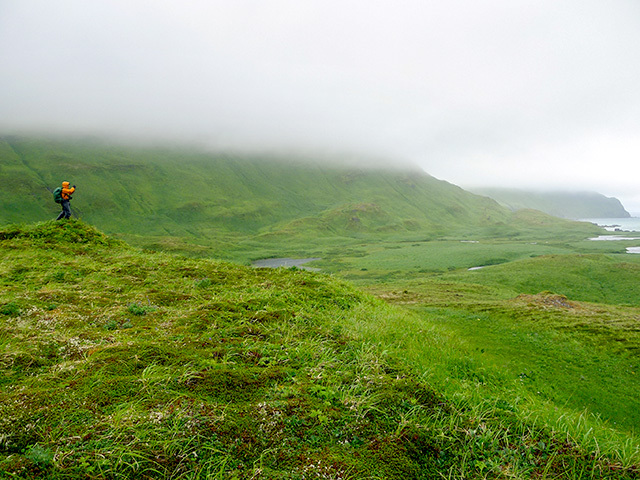 A seemingly insignificant find has led to evidence of prehistoric tsunamis on the remote Aleutian island of Sedanka. It also raises the possibility that this section of the Aleutian subduction zone could generate a large earthquake and a powerful tsunami. 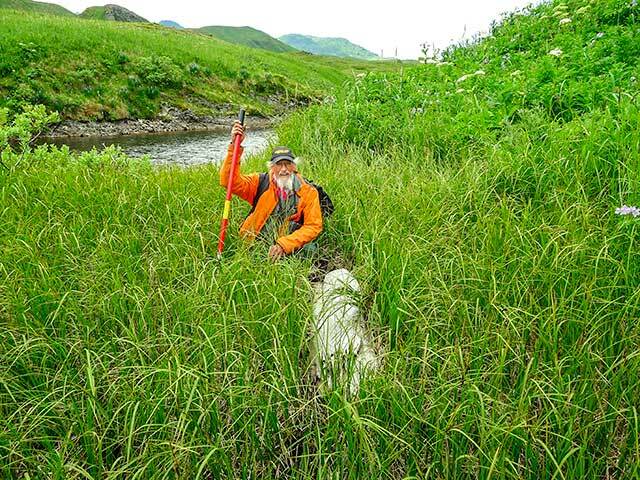 On the remote Aleutian Island, Sedanka Island, USGS geologist Rob Witter surveys the Stardust Bay lowland, which has been inundated by at least six tsunamis over the last 1,700 years. In 1998, on a trip to the remote Aleutian island known as Sedanka Island, then Humboldt State Geology Professor Gary Carver stumbled across driftwood in an unlikely place. About 15 years later, Carver’s seemingly insignificant find has led to evidence of prehistoric tsunamis on Sedanka. It also raises the possibility that this section of the Aleutian subduction zone could generate a large earthquake and a powerful tsunami that could potentially inundate Hawaii and the western coast of the U.S. The 1,200-mile long chain of Aleutian Islands extends along the Aleutian Trench, a subduction zone where the Pacific Plate pushes below the North American Plate. Sedanka is part of the archipelago’s 125-mile long eastern zone. For years, scientists believed the eastern region wouldn’t generate quakes large enough to create tsunamis because the plates are “creeping.” Unlike locked plates, which build pressure that leads to a quake; creeping plates should, in theory, relieve tectonic stress. “Virtually the entire Aleutian subduction zone has ruptured in last 100 years. But there are a few seismic gaps that have not. The eastern zone is one of them,” says Koehler (‘98 Geology). A former student of Carver’s, Koehler is a Geology professor at the University of Nevada, Reno, and a research scientist with the Nevada Bureau of Mines and Geology. What Carver found on Sedanka decades ago suggests otherwise. HSU emeritus Geology Professor Gary Carver stands next to a log that was likely carried inland by a tsunami. While exploring the island, he spotted something unusual. “I stumbled across an old log covered with moss. And that log was on an island that doesn’t have and never has had trees,” he says. After finding more logs, he started digging. Sure enough, he found sand sheets nearly 50 feet above sea level. “The only source for the beach sand was the beach, which is a half-mile away,” he says. “It’s just mind bending to be so far from the ocean and standing on a driftwood log that was carried by a tsunami,” he recalls. In 2012, Carver, Koehler, Witter, and others returned to the same spot on Sedanka and dug deeper into the hole. They found six to seven layers of sand, or sand sheets, in between layers of peat. Witter sent a core sample to longtime colleague, Eileen Hemphill-Haley, a Geology Department research associate whose focus is tsunamis and diatoms. 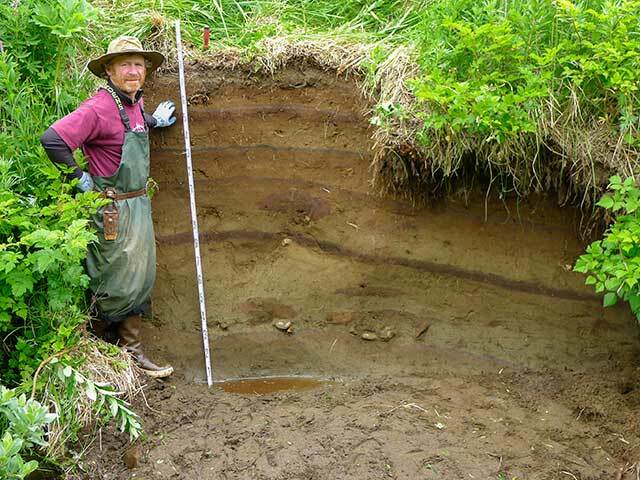 HSU alumnus Rich Koehler shows layers of tsunami deposits (tan layers) separated by soils (dark layers). Smaller than a grain of sand, diatoms are a type of algal microfossil found in freshwater and marine environments. When Hemphill-Haley examined the peat sample from the Sedanka , she wasn’t surprised to find an abundance of freshwater diatoms that thrive in the marshy wetlands of the island. The sand sheets were a different story. They revealed not only freshwater diatoms, but also distinctive ocean diatoms, leading Hemphill-Haley to suggest some of the sand was likely from the shallow marine shelf offshore. “This tells you something about the size of the tsunami. A wave that picked up sand from the shelf offshore where these marine diatoms are found has to be pretty big,” she says. Based on Hemphill-Haley’s research and other findings, the team concluded tsunamis pushed up and over the beach, flooded the lowland and surrounding hillside, each leaving a swath of sand in its wake. The oldest sand layer dates back 1,700 years. The longest interval between tsunamis is 540 years and the shortest, 170 years, which means tsunamis have occurred approximately every 300-400 years. The team estimates the most recent sand sheet is from a tsunami generated by the 8.6-magnitude earthquake in 1957. There were no fatalities in that quake, but the tsunami reached Hawaii, destroying two villages and caused $5 million in damage. Evidence of tsunamis on Sedanka sheds new light on tsunami inundation hazard zones for the Hawaiian islands and Alaska, as well as along the well-studied Cascadia subduction zone off the Washington, Oregon, and California coasts. Understanding earth’s puzzles and making geological discoveries isn’t new for Carver. During his tenure at HSU from 1973 to 1998, Carver was instrumental in finding and naming Humboldt County’s Mckinleyville, Trinidad, Mad River and several other faults. He and his graduate students were the first to identify them as active and show they’re part of the Cascadia subduction zone. Carver often involved students in research, says Koehler, who worked closely with Carver as a graduate student at HSU and throughout his career.